Brain Sentinel, Inc. announces new CEO, Chris Fashek, effective immediately. The Board of Directors of Brain Sentinel, Inc. announced today that Chris Fashek, an internationally recognized healthcare business leader, will serve as Chief Executive Officer and member of its Board, effective immediately. Fashek will oversee the commercial growth of the company’s medical and consumer products. Mike Girouard, co-founder of the company, will continue on as President, Brain Sentinel, Inc. Brain Sentinel, Inc. is a privately held device start-up based in San Antonio, Texas, that manufactures and markets two sEMG-based seizure alerting systems. The SPEAC® System, which was cleared by the FDA in 2017, is the diagnostic monitoring medical system available by prescription. The company is launching a direct-to-consumer system, SeizureLink™, which is available without a prescription. Brain Sentinel is committed to helping people gain better control over their seizures and provides physicians with the diagnostic tools to develop the most effective treatment plan. Prior to joining Brain Sentinel, Fashek served as CEO at Atteris Healthcare LLC, commercializing advanced wound care products, as well as the Vice Chairman of Rochal Industries, an R&D company focused on creating technologies that improve healing and other skin care products. Chris has led a number of healthcare companies. He was Chairman and CEO at Spiracur Inc., a venture capital backed startup in the negative pressure wound therapy industry, Chairman of Systagenix and President and Vice Chairman of KCI USA, currently known as Acelity (KCI). Earlier in his career he managed several businesses in both U.S. and international markets, including pharmaceutical, OTC medicines and consumer products for Sterling Drug, a division of Eastman Kodak. Chris and his wife, Christine, reside in San Antonio. 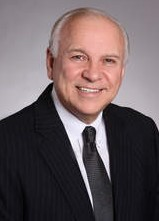 He serves as the Chairman of the Board at NanoVibronix, Inc., and as a Director of Argentum Medical, the IDN Summit, the World Craniofacial Foundation, the McKenna Lecture Series at ASU and on other commercial and charitable boards. Chris received his MBA from Fairleigh Dickinson University and his Bachelor’s degree from Upsala College.